For many years I was a die-hard sport bike guy. I rode my GSXR clad in my Vanson road race leathers and Alpinestar boots. I rode like the wind, laughed at death and frequently made fun of the old farts in their dumpy looking Aerostich suits. I held deep respect for the makers of the gear, as I’ve always heard impressive stories about owner Andy Goldfine, and some of my friends who otherwise seemed quite logical swore by the suits but still I couldn’t ever imagine switching from the incredibly protective (not to mention somewhat svelte looking) leathers to a bulky Roadcrafter suit. That was then, this is now…Once my birthday cake started needing more than 30 candles, not to mention once I needed to send my Vanson jacket in for an expensive “loosening” around the mid-section, I began to rethink things. I started to notice that I didn’t ride the GSXR all that often once I bought the Beemer (oh the shame!) as commuting to work on the big Bavarian bomber was so much easier. All the lockable luggage on the big GS meant that I could lock my riding gear up rather than schlepping heavy leathers through the office. The final nail in the coffin was that I started to ride in to work with only the leather jacket and jeans where I’d previously been pretty religious about wearing all my gear. 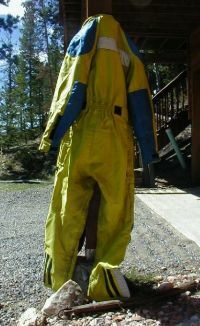 So in the spring of 2002 I revisited my youthful reservations about the Aerostich Roadcrafter suit and whipped out the credit card to finally take the plunge. As expected, the suit was excellent quality. I’d spent a lot of time trying on friend’s suits, so had the size really close but still had to go through the usual process of returning it once for final alterations. I also sprung for all the safety stuff, even though it cranked up the frumpy, bulky look to 11. I got the optional back protector and hip pads in addition to the standard shoulder, elbow and knee pads. I also went overboard on the safety mindset by ordering the eye-melting “hi viz” yellow. Whoo whee, no missing this thing. If anyone ever hits me and then says “I didn’t see him” I hope the cop dope slaps them… All said and done, I look like a sickly version of the Michelin Man. So far, so good. Good company to do business with, great products, lots of options to customize. That’s it. Turn out the lights, flip the closed sign and declare this product evaluation done, right? Nope, remember, I’m trying to focus on companies that also offer excellent customer service in addition to a good product. So fast forward three years. I’ve put about 40,000 miles on the suit and also bought various other products from them like their Combat Touring boots. All have held up great, though the suit does sometimes reveal it’s “water resistant” rather than “water proof” rating by leaking rain water through the zipper…usually straight onto my crotch. Nothing like riding through a cold pouring rain and then getting home looking like you had a little “accident” along the way. “No dear, I just need rain suit pants, not depends”. Also as advertised, the “hi viz” color shows dirt. In fact, it looks pretty dingy after the first season of riding but then doesn’t get that much worse over subsequent seasons. Otherwise no problem with any of the gear until a couple of months ago. While getting ready for work one morning, I managed to break the zipper on the right leg. I gave it a good tug and the pull tab just popped right off. I was able to zip (and, thankfully, unzip) the suit for the day’s commute but clearly I needed it fixed, preferably quickly so it wouldn’t eat into my riding time. I called Aerostich’s repair department and was quickly connected to someone. who gave me an estimate that seemed impossible ($15?!?!). I asked about cleaning and they offered back a reasonable price for that too. Still stunned, I boxed the whole one-piece suit up and shipped it off. A week later I got a call confirming my work order (cleaning, re-waterproofing and zipper repair) and got a total price quote of under $100, including shipping. Wow, fantastic! Then, no muss-no fuss, the suit arrived back a week later. While the “hi viz” color wasn’t totally restored it did have a little of its nauseating glow back. The zipper was fixed and the suit got a “A-OK” checkout from the maker…time to put on some more miles. So even though it was just a simple zipper repair, I am altogether satisfied with the folks at Rider Warehouse. They are a group of motorcycle enthusiasts that make great products focused specifically at equally enthusiastic riders. They make a solid product and, once you get past the purchase price, offer reasonably priced repairs, maintenance and support. Just don’t wait till you are middle aged to buy one! The second company to get a thumbs up from me is motorcycle luggage maker Chase Harper. I’ve been a satisfied customer of Chase Harper for a long, long time. I bought my first soft luggage from them back in ‘91: a set of Aero Pac saddlebags, an Aero Pac tail trunk and an 1150 tank bag. I was immediately happy with them and couldn’t wait to try them out with a bike camping trip. Unfortunately, that also meant that I had an immediate need to test their warranty. You see, Chase Harper makes a great product and in addition to a top notch build quality and excellent features they also include an amazing unconditional lifetime warranty. Their saddlebags include a little plastic shield, which should protect them from your common idiotic mistakes. Well, as I’ve proven from my Box of Shame postings, at times I can be a particularly uncommon idiot and this was one of those cases. I pre-packed the saddle bags the night before leaving for a bike trip to Road Atlanta to enjoy the ‘91 WERA GNF races. When packing, I was careful to put the camp stove fuel in the saddle bag that would be on the opposite side of the bike from the exhaust pipe. Well, Saturday morning I went to put the bags on the bike and realized they fit better swapped around the other way. What I didn’t realize was that this change moved the fuel directly above the exhaust. During the ride, the hot Yoshimura pipe heated the fuel bottle to the point that it pressurized and misted Coleman fuel inside the saddle bag. That then started smoldering resulting in my GSXR trailing a cloud of smoke like a wounded WWII fighter plane. My riding buddy Troy waved me over and we managed to frantically remove the bag and extinguish the charred clothes inside but not before a four inch hole was melted through the back of the right hand saddle bag. So that story clearly shows that I made an incredibly stupid mistake and roasted my new saddle bag. Nonetheless, when I called Chase Harper to get a new saddle bag they reiterated that their warranty is an unconditional guarantee and that includes user error. A few days later I received a box in the mail the contained a brand new right side saddle bag. Wow, how do you argue with a company that offers that kind of service? That story alone would make me a lifetime devotee of the company. But I had another chance to experience the benefits of their warranty and this time it wasn’t because I was brain dead… In 2003, I finally got my old GSXR running again after a mini-restoration and went through all my storage boxes and dug out my old Chase Harper gear. The saddle bags and tail trunk looked great but the 1150 tank bag showed every bit of the 70,000 miles it had endured over 12 years. All the velcro was worn out, one of the strap rivets had come apart, the map case was sun faded till it was opaque and the front compartment’s zipper was broken. I sent the tank bag back to Chase Harper to get a repair estimate for the various bits and pieces. A few days later, like deja vu, a box arrived with a band new 1150 tank bag. No questions asked, no money owed, just a new tank bag to replace the one that I’d flogged like a rented mule for over a decade. As I said in my first Product and Company Review blog entry I think that a company’s service is even more important than their product. In this regard, Chase Harper is probably the best manufacturer in the entire motorcycle industry. I’ve bought Chase Harper luggage as gifts for two other people based strictly on my knowledge that Chase Harper stands behind their product like no one else. If you’re looking for soft luggage for your bike (or storage bags for hiking, bicycling or winter sports) check them out. One thing I’ve been meaning to add to the web site is a section where I can give companies a thumbs up or a thumbs down for their customer support. I regularly see sites that review products but rarely do I hear a mention of people’s experience with a company, unless its a write up bitching about something breaking. Personally, I understand that things sometime break and what I care about is how the manufacturer deals with that more than I am about outright device reliability. I’ve posted before on here that I’ve done some bone-headed things…Pretty much all of my “Box of Shame” postings are evidence of this. Despite the fact that they often reflect negatively on both my intelligence and skills, I post them in the hopes that others can learn from them and avoid some of those same mistakes. Well, this new series of articles will hopefully have a similar affect by giving readers recommendations of some companies that, at least at the time of the article, offer the kind of product and customer support that deserves mention. As an aside, many of these articles are necessary because I did something stupid and had to call for support in the first place. Even if the company information isn’t useful you will hopefully get some sort of sadistic pleasure in reading about my misfortune. The Motorcycle Safety Foundation is a wonderful organization. They teach a lot of crucial information about safety and they help new riders become old riders. Among the nuggets of knowledge they pass along in their courses is the following “Always put your helmet on the ground or else gravity will put it here for you”. Wise words that. Still, despite having taken at least four different MSF courses, I still have the bad habit of leaving my helmet on top of my motorcycle when I park it in the garage at night. Well, this week I walked out to find that gravity had indeed done its work and my helmet was lying on the garage floor. 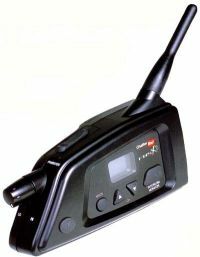 I happened to have a HJC Chatterbox FRS-X2 on my Shoei at the time so that I could listen to MP3s while I rode. The weight of the batteries apparently helped make sure that the Chatterbox hit the floor first when the helmet took its dive. (Why scratch up a five year, beat-up helmet when you can crack a new $150 radio unit instead?). The result is that the removable panel which houses the batteries ad the latching tabs break off. Realizing the only fix was to call HJC and humbly admit by idiocy, I picked up the phone and called the customer service number listed on their web site. A chipper fellow answered (why do I always get the cheerful guy when I call to tell someone I made a stupid mistake and broke their product?) and I hesitantly asked if they offered replacement battery compartment panels and how much it would cost me. Imagine my surprise then when, instead of greedily rubbing his palms and dreaming of record quarterly profits, he said “No problem, I’ll send you one for free”. Huh? Excuse me? I must have misunderstood. Did you say free? Yup, he popped it in the mail that afternoon. While I had him on the phone I asked him some questions about a problem I was having with my wife’s Chatterbox (the older model FRS-X2 won’t work with the new noise reducing headset but the newer model works fine with the old headset). That’s my kind of company. Now I’m sure if everyone on the internet started calling wanting free parts they would have to stop this practice but I’m not worried about having so many blog readers that their phones will be ringing off the hook. What I do hope to accomplish is to show that there are companies out there that go the extra mile to make their customers happy and HJC is one of them. I’m willing to buy my future Chatterbox accessories, like the noise reducing headset I need, directly from them rather than trying to score a cheaper deal off ebay. I want to give my money to companies that care about their product *after* the sale. As for the Chatterbox unit itself, I still have mixed feelings. The unit works pretty well as an intercom but I found you have to be very careful with the cable to the passenger’s helmet. If it flaps about in the wind, it will break something inside the connector. We went through two before finding a secure way to mount it. It is also very important that the helmets have some sort of guard around the chin area or you get so much wind noise that the voice activated mic is constantly on. Once I get the correct headset in my wife’s helmet, we’ll try the bike-to-bike radio functionality. My only other complaint is that there isn’t an easy way to use just the speakers. I’d like to attach a MP3 player to the speakers but the only way to do that is to mount the FRS unit and use the audio-in jack on the Chatterbox. If I could just wire up an adaptor that would go from an RCA jack on the mp3 player to the funky HJC mini-DIN jack I could use the speakers without requiring the FRS-X2. Those issues aside, the FRS-X2 seems to be a well made and reliable unit…just don’t leave it sitting around on top of your bike or you’ll learn a lesson you should have learned in the MSF course!